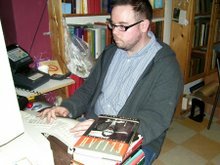 Paul Vermeersch: Where is Alden Nowlan's Collected Poems? Doesn't Anansi have the rights? If not, they should know who does, since their Selected Nowlan is still in print. Maybe they don't want any competition for it? It is unthinkable, no, that a pillar of Canada's literary culture should stonewall the legacy of one our greatest poets? Actually, there was a comprenhensive antology of his poems put out in the very late 1980s or 1990, bout. I had it and leant it to myh brother, who of course lost it. Not only a great Canadian poet but a great world-class one.